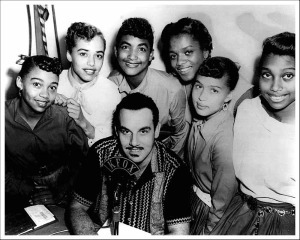 Johnny Otis, the great bandleader, writer/performer/producer, nurturer of musical talent, political activist, broadcaster, preacher, visual artist, and apple grower has died. He was 90 years old. Otis lived his life if not passing then certainly living more comfortably among blacks, participating in the struggle for equality in the early ‘60s, and becoming adept at his own political and spiritual speechifying. His first book, Listen to the Lambs concerned the Watts riots of 1965. Influenced early on by Minister Malcolm X, Otis ultimately entered politics working as Deputy Chief of Staff to Mervyn M. Dymally, a lifelong California politician. Otis also started his own churches, the Landmark Church in Los Angeles, turned Landmark Community Gospel Church in Santa Rosa: All were welcome. “The most meaningful activity at our church was feeding homeless people,” Otis wrote. Otis was also a visual artist with paintings, carvings and sculptures to his credit; believe it or not, he also marketed a line of apple juice, made from apples grown at his Sebastopol farm. Splitting his life between his native Nor Cal and his adopted Southern California homes, he died in Los Angeles, leaving his wife of 60 years, Phyllis, and an entire extended Otis clan. 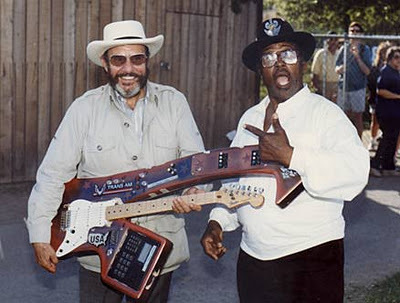 My condolences to all of them, and to all those who loved him: “Rock Steady”, Mr. Otis, and thank you. Johnny Otis is among the artists whose stories contribute to the rich history of where music meets social and political activism. Read more about Otis and others like him in Keep on Pushing. He told his own story in Upside the Head! Rhythm and Blues on Central Avenue, available through his website.